The free market has become the accepted model for the public sector. Politicians on all sides compete to spread the gospel. And so, in the UK and elsewhere, there's been massive investment in public sector 'improvement', 'customer choice' has been increased and new targets have been set and refined. But our experience is that things haven't changed much. This is because governments have invested in the wrong things. Belief in targets, incentives and inspection; belief in economies of scale and shared back-office services; belief in 'deliverology... these are all wrong-headed ideas and yet they have underpinned this government's attempts to reform the public sector. In this much-talked-about book, John Seddon dissects the changes that have been made in a range of services, including housing benefits, social care and policing. His descriptions beggar belief, though they would be funnier if it wasn't our money that was being wasted. In place of the current mess, he advocates a Systems Thinking approach where individuals come first, waste is reduced and responsibility replaces blame. It's an approach that is proven, successful and relatively cheap - and one that governments around the world, and their advisers, need to adopt urgently. No policy maker or public sector manager can afford NOT to read this book. And, if you don’t believe the author, read the two volumes of Case Studies based on this approach. 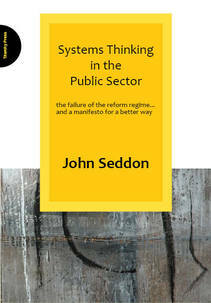 "Systems Thinking in the Public Sector ... is an extraordinary insight into why, at the end of each month, millions of us are left wondering where on earth all the money taken from us in tax has gone." "The argument compellingly made in this book by John Seddon is that the Government has designed failure into almost everything it does on our behalf. It has not done so deliberately; but it is culpable because it has failed to listen to people who know better how to run services on behalf of the customer rather than the producer."